Do you have any info about Lily’s Aramburo’s disappearance? 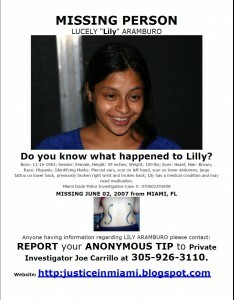 Lily Aramburo, a Miami resident and 23 year old mother was last seen by family and friends the night of June 1, 2007. At approximately 2am, she had an argument with her live-in boyfriend and walked out of his condo never to be seen or heard from again. We have reason to believe Lily may have been a victim of homicide but many questions remain unanswered. And that is why we desperately need your help. If you know anything at all or have information regarding the disappearance of Lucely “Lily” Aramburo, please contact Det Segovia at 305-418-7200. You can report TIPS anonymously to Crime Stoppers at (305) 471-8477. (You can get a cash reward) It offers complete anonymity.